The United States Marines have one of the most demanding jobs in America, they serve and protect their country on a daily basis. In order to keep up with their task, a Marine needs a conditioned cardiovascular system and muscle strength. Recently, an increase in duty-related injuries and a demand for improved mission performance has resulted in the birth of a new type of training center. The U.S Marine Corps launched its first High Intensity Tactical Training (HITT) Center early in the month of September at the Marine Corps Air Station New River, North Carolina. So how does Cybex function into all of this? The new HITT programs are designed to meet all of the Marine’s deployment training cycles (pre-deployment, deployment, and post deployment). They are designed to develop specific strength and cardio gains for optimum combat performance, injury reduction, post-combat physical recovery, and readiness. To accomplish the goals of the program, a great deal of non-traditional strength-enhancing gear such as kettle bells and training ropes. One major exception this inventory is Cybex equipment and, in particular, the Arc Trainer. The unique features of the Arc Trainer suit it to be the centerpiece of the HITT Program and it’s facilities. Marine Corps Lt. General Coleman sites the Arc’s scalable resistance based as a perfect training tool for servicemen, “A Marine can enter his weight at 100 pounds heavier than actual, to account for combat body armor, ammunition, helmet and weapon, and the Arc Trainer will load resistance based on this weight…” Essentially, the Arc Trainer conditions a Marine dressed for a real life scenario which is vital in achieving the precise goals of the HITT program. 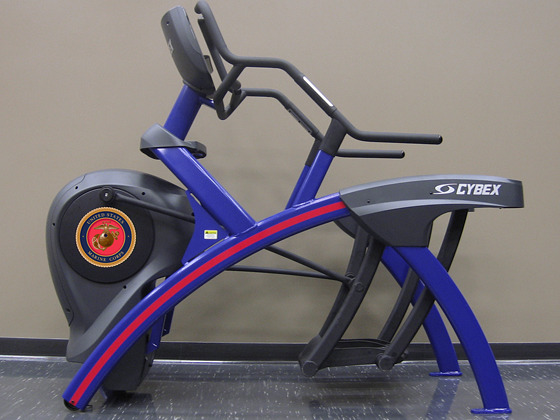 Cybex could not be more proud of supporting the conditioning of U.S Servicemen. Our mission is help active duty troops develop the strength, cardiovascular fitness, muscular endurance, raw power and mental toughness they need to succeed. 10 powerful Arc Trainer programs and workouts to help you get more from your workout. As part of #ARCtober, we're celebrating the Arc Trainer all month long.